WASHINGTON, DC – This week, Singapore Prime Minister Lee Hsien Loong is in Washington, DC for a trip that will include a summit meeting with U.S. President Donald Trump on Monday. Though the headlines may focus on individual bilateral deals announced or comments that Lee makes at his various engagements on regional developments, the real uncertainties for both countries will lie further ahead. Both the United States and Singapore have long viewed each other as vital partners. The United States is Singapore’s top foreign direct investor and a key provider of defense technology and facilities for military training, while the city-state has played an outsized role as a U.S. regional partner, at times one even bigger than some treaty allies. Under the Obama administration, U.S.-Singapore ties strengthened considerably as part of its wider rebalance to the Asia-Pacific, with the relationship formally upgraded to a strategic partnership in 2012 and both sides inking a new Enhanced Defense Cooperation Agreement (DCA) in 2015 (See: “The New US-Singapore Defense Pact”). Indeed, Lee was just in Washington last year for an official visit to commemorate 50 years of diplomatic ties between the two countries. Just over a year later, Lee is back in Washington amid a much more challenging environment. Bilateral ties are themselves quite good, a testament to how mature they already are relatively speaking. 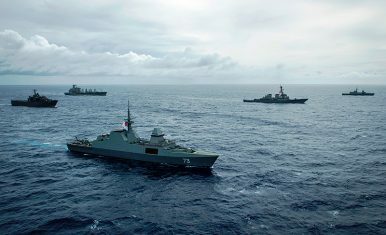 There have been a flurry of visits by both sides and cooperation is being advanced, including in the defense realm (See: “What’s With the New US-Singapore Maritime Exercise in Guam?”). During Lee’s visit, which lasts till the middle of the week, he will be meeting Trump and speaking at several engagements, becoming the fourth Southeast Asian leader to make a trip here during the first year of a new U.S. administration. The column inches devoted to the visit will likely be focused around individual agenda items like counterterrorism or deals such as one for Singapore Airlines (SIA) to buy more Boeing planes. And privately and perhaps publicly in a more cautious way, Lee and his delegation can be expected to dispense the sort of blunt feedback on U.S. policy and regional developments that Singapore has become known for over the years, amid some worrying signs such as Trump’s withdrawal from the Trans-Pacific Partnership (TPP) trade pact and uncertainty surrounding other important policy areas including China policy (See: “The Real Challenge for US-ASEAN Relations Under Trump”). Yet beyond the headlines, the uncertainty for both countries is more in what lies ahead for them individually and bilaterally, primarily at the domestic and regional levels. For the United States, its ties with Singapore will be shaped in the coming months as the Trump team gets its domestic agenda in order ahead of the 2018 mid-terms, builds out its wider foreign policy, and begins to develop its Asia strategy, which Southeast Asian officials have been anxiously waiting for (See: “The Ticking Clock on Trump’s Asia Strategy”). Trump’s first Asia trip next month is a big step, which many will be watching. The visit, announced uncharacteristically early for a U.S. administration, will include Southeast Asia stops in the Philippines and Vietnam, where Trump is expected to deliver a speech outlining the U.S. vision for the region (See: “Why Trump Should Go to ASEAN and APEC in Vietnam and the Philippines”). As for Singapore, it too will be moving toward a busy few months. Singapore will be taking on the 2018 chairmanship of the Association of Southeast Asian Nations (ASEAN), held by the Philippines this year. While the city-state has never been shy about leading on issues that are dear to its interests and its chairmanship will see progress on some key areas regionally, much like its role as country coordinator for ASEAN-China dialogue relations, it will also be a tricky balancing act, particularly as it has had to deal with a more assertive Beijing (See: “China: New White Paper, Old Asia Conundrum”). At home, though Singapore’s political challenges are not nearly as severe as that of other countries in Southeast Asia – a few of which are gearing up for polls in 2018 and 2019 – the city-state is making a gradual shift to a more competitive political landscape. While Lee’s ruling People’s Action Party (PAP) has continued to perform well at the polls, the worry among some in the city-state is that a more contested domestic political environment could also make it more difficult for it to forge a more unified and strategic foreign policy. As we take stock of the deliverables from Lee’s U.S. visit this week, it is worth keeping this longer-term picture in mind for these two strategic partners as they both navigate the uncertainties that remain in the months ahead while forging closer ties. Both sides held the latest iteration of Exercise Lightning Strike earlier this month.